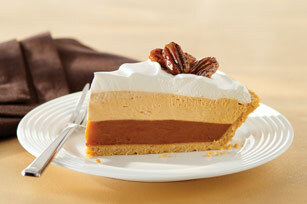 Keep dessert super sweet and super simple with our Easy Triple-Layer Pumpkin Spice Pie. Topped with creamy COOL WHIP and crunchy PLANTERS Pecans, this Easy Triple-Layer Pumpkin Spice Pie is ideal for Thanksgiving. Beat dry pudding mixes, cinnamon and milk in medium bowl with whisk 2 min. ; spread 1-1/2 cups onto bottom of crust. Stir 1-1/2 cups COOL WHIP into remaining pudding; spread over pudding layer in crust. Top with remaining COOL WHIP. Refrigerate 1 hour. Meanwhile, cook nuts and honey in skillet on medium-low heat 2 to 4 min. or until nuts are caramelized, stirring frequently. Spread onto waxed paper, separating large clusters. Cool. Sprinkle nuts over pie just before serving. At 10 servings, this creamy pie makes enough to feed a crowd. Substitute 1/2 cup small peanut brittle pieces for the caramelized pecans.